Alyson Shade (E-RYT 500, E-RYT 200, YACEP) is the founder of Realignment Studio. She embodies the studio’s vision to share the practice of yoga as a means for self-care and self-study, an unwavering commitment to always coming home to your most authentic self. Alyson's first experience with yoga was in the form of a power yoga VHS when she was a freshman in high school. While her preferred style changes from time to time depending upon life transitions, 18 years later her love affair with the practice is still going strong! Alyson completed her first teacher training in 2012, left her career at the Department of Defense, and has been teaching full-time ever since. Alyson has taught over 3,000 hours of yoga classes and is registered Yoga Alliance teacher at E-RYT-500 and E-RYT 200 levels. Alyson also holds certifications as a Yogahour Teacher and Professional Intuitive Energy Healer. In her classes, Alyson strives to help her students understand that there is more at work than the shapes of their bodies. She balances the sacredness of the practice with the element of play, and adheres to the safest alignment principles while allowing the flow of grace to influence her sequences. She emphasizes the power of self-care and and the accessibility of personal transformation through a consistent yoga practice. Alyson has lived and worked on Capitol Hill since 2009. Betsy Poos (E-RYT 500, RPYT) has been teaching yoga on Capitol Hill in Washington, D.C. since 2005. A familiar face in the neighborhood, Betsy brings her love for community building and her local business expertise to Realignment Studio. A writer, athlete and former dancer her classes are equal parts accessible, artful, and challenging. Betsy's classes aim to increase your range of motion, flexibility and strength of body and mind. She has taught well over 3,000 hours of yoga classes and is proud to maintain the highest level of training and teaching experience recognized by Yoga Alliance. Betsy lives near Eastern Market with her four most influential teachers; her incredibly patient husband, two strong willed daughters, and lovable boston terrier. Alia's desire to share yoga with others grew out of her own journey for empowerment and self-care. She first stumbled into a hot yoga class while in college, but her love of yoga deepened after she returned to D.C. from a stressful job as special education teacher in one of the most under-resourced schools in the South Louisiana. Alia received her 200 hour certification in Vinyasa/Power Yoga in Washington, DC in 2012 under Angela Meyer, and completed her 500 hour certification through Yogaworks Baltimore under Kim Manfredi in April 2017. She has also earned certificates in Yoga Philosophy for Kids Grades K-12. Alia is most energized by empowering others to reach their full potential and sees yoga as powerful vehicle to help people find balance, come “back home” and share their best selves. Her style is energetic, friendly, and focused on proper alignment with a strong attention to linking movement with breath. In her classes, you can expect to feel safe and cared for, yet very challenged. You’ll break a good sweat, but first and foremost, will be encouraged to move at your own pace. Aqeel’s classes are accessible to all levels, and include instruction on yoga asana (posture) practice, pranayama (breathing techniques), meditation, and yoga nidra (deep relaxation), as relayed to him by Sri Dharma Mittra. It is his honor, and privilege to share the teachings and techniques he has received from Sri Dharma. He believes that each of us has the potential for exceeding our expectations if we are willing to renounce our arrogance, doubts, and fears. The sacred science of yoga has the capacity to lead us from ignorance into truth, but it is our conviction to our own self-development that makes it possible. Courtney's first yoga experience was in 2001 in New Orleans. She had just finished college where she had studied Sanskrit and Hinduism. She took a six-week hatha yoga course for beginners. She still couldn't touch her toes and thought of yoga very little until ten years later. At that time, a friend pestered her to go to a yoga class until she finally gave in. After that, Courtney was hooked and within two months made the decision to deepen her practice and ultimately to become a yoga instructor. Courtney earned a 200-hour yoga teaching certificate from Black Swan Yoga (Austin, TX) in 2013 and is registered as an RYT-200 with Yoga Alliance. Courtney's vinyasa-based classes are upbeat with music to match, always ending in a few restorative poses to recenter yourself and realign with the reason why you stepped on your mat. She enjoys teaching students of all levels and is particularly interested in sharing proper alignment with beginners. 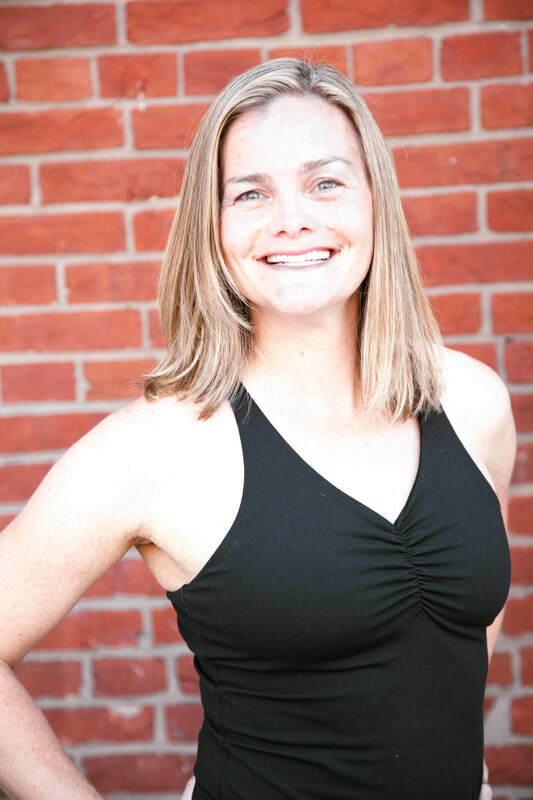 Courtney teaches beginner yoga, gentle yoga, power yoga, vinyasa yoga, and yoga for runners/athletes. She's committed to deepening the yoga practice through space. Allowing space to listen more deeply, recognizing space between breaths, noticing space between poses, and observing moments of stillness and reflection. Courtney commits to meet you wherever you are in response to you committing to step on your mat. You are in the pose. When she's not on her mat or engaging in self-study, Courtney might be found playing music, running, listening to music, running while listening to music, or finding some other way to express herself. Courtney loves being outside -- so much so that she got to live outside almost exclusively for six months when she hiked the Appalachian Trail. Yoga became part of Elina's life a few years ago, and it took place as a healing practice. At first 20min of asana practice seemed a difficult thing to go through, but the rewarding feeling of joy and peace afterwards kept her coming back to the mat. In 2015 Elina moved from her home in Bulgaria to the city of Washington DC, where she found Capitol Hill Yoga. Class after class, Elina was witnessing how her yoga practice was helping her grow stronger, more flexible, and braver on and off the mat. As a Pre-K teacher at the time, Elina started incorporating yoga in the classroom and saw the multiple positive effects that asanas and breathing techniques can have on children. In 2016 Elina decided to turn her passion for yoga into a career path as well. She took her 200-hour Yoga Teacher Training at Capitol Hill Yoga. She will alway be a student and be grateful of all of the amazing teachers she has had. In Elina's classes she loves to teach creative sequences, harmoniously designed to build strength and flexibility, inspiring students to deepen their own practice. She seeks to help others feel free and ease in the body , peace of mind, and joy in the heart after they step of the mat. Yoga for Elina is a journey of unlimited possibilities, a joyful space to find freedom in her own body and mind, a creative expression of the self. Hannah Allerdice Bricker has been studying yoga for 17 years and studying with Sri Dharma Mittra for the last 11 years. She has completed her 200, 500 and 800-hour trainings with Sri Dharma. She has been teaching in DC for 9 years and serves in the teaching staff of Sri Dharma Mittra's Life of a Yogi Teacher Trainings in New York. Hannah’s first yoga class was as a college freshman and she knew this was something special! Before delving deeply into yoga, Hannah studied and worked in Conflict Resolution and stress management education. Her constant inspirations are her family and friends, Sri Dharma Mittra and all beings. She believes that everyone deserves to be introduced to the teachings of yoga and to suffer less in this life. These passions have led her to serve as a Co-Founder and Executive Director of Dharma Yoga DC - a non-profit in Washington DC that shares the HomeBase program of Whole-Self Education to students, educators and families and to the Washington DC community more broadly. The mission is to expand the reach of yoga so that evermore people can begin to truly care for themselves and others and thus bring about day-in, and day-out compassion and harmony in life. Jen’s relationship with yoga began with a pre-natal class at Dancing Heart Yoga on Capitol Hill many years ago. The relationship was not a whirlwind romance rather a long, steady build up over time but gradually she fell in love. After many years of trying on styles and studios all over town she began teacher training in 2014 at Yoga District on her 44th birthday. Her classes are vinyasa reflecting the influence of her many years trying on various styles but with a connection to the breath, heart and mind. Katie Rutterer started yoga as a way to connect body and mind. Through practice, Katie realized that negative self talk was holding her back from being her best and kindest self. Yoga helped to heal that relationship. Katie studied with Darren Rhodes and Christina Sell in Tucson, AZ and has been teaching yoga for 6 years - the last 3.5 in DC at Realignment Studio, Capitol Hill Yoga, US Fitness & Health, and Old City CrossFit. Besides being a E-RYT 200 and Yogahour certified, she is also a L-2 CrossFit coach. Katie believes in moving the body in someway everyday - whether it’s dance, yoga, CrossFit, or whatever. Lauren Alfred (RYT-200) came to the yoga mat looking for physical strength and challenge and stayed for community and the spiritual richness of the practice. She completed her teacher training at Flow Yoga Center in DC. Lauren incorporates fluid, breath-guided movement into her flow sequences to cultivate mindfulness and body awareness. During the day, she works passionately for violence prevention, inspired by the strength of her fellow advocates. Lauren is renewed through time with her wonderful husband and their odd-couple pups and by escaping from the Hill to the mountains whenever she can. Lula has been around yoga her whole life, but it wasn't until graduate school that she realized its essential role in her future. She completed her RYT-200 at Tranquil Space in 2016 while she finished a Master's in Art Therapy. As a therapist, Lula recognizes the power of the mind-body connection, and the incredible ability yoga has to access the two together. Lula was trained in vinyasa, but she likes to blend a balance of foundational familiarity with playful improvisation. When she is not on the mat, she enjoys creating artwork and playing with her two house bunnies. Melanie Williams, RYT-200, found yoga while experimenting with ways to build a relationship with a body she had largely disconnected with. After many years of dedicated personal practice, she completed her 200-hour yoga teacher training at Capitol Hill Yoga in 2016. Melanie is described by students as a welcoming, intuitive, and adaptively challenging teacher, and by peers and mentors as both knowledgeable and constantly learning. When she's not teaching or practicing, she can be found managing a holistic wellness center on Capitol Hill or advocating for diversity and accessibility in the yoga industry as a member of the Yoga & Body Image Coalition's leadership team. Yoga for Monica began as a physical practice to steady her "monkey mind" through asana practice. Her growing fascination with aspects of yoga beyond the asanas led Monica to seek advanced training. Honoring her studies with Iyengar teachers, Monica's classes bring a strong focus on precision and alignment, while cultivating an open- hearted practice that honors all eight limbs of yoga. She has studied with a variety of teachers, including Seane Corne, Hala Khouri, Felicity Greene, George Purvis and Julian Walker. Monica has over 15 years of teaching experience and her studies of Anusara, Vinyasa and Iyengar lineages make for eclectic classes that challenge students to learn yoga's foundations while opening their hearts and connecting with spirit. After completing an Iyengar apprenticeship, Monica completed her 200-hour Yoga Teacher Training program through Shanti Yoga School in Idaho. She is also a graduate of the Off the Mat, Into the World program and an authorized Yoga in Action leader. Her passion for social justice and trauma-informed care infuse her classes with curiosity, inquisitiveness, tenderness, understanding and playful joy. When not in the studio Monica loves running half-marathons and attempting to tire out her puppies, Mavis and Maia. Paul has been practicing and teaching yoga since 1992. His hatha yoga classes typically unfold slowly from a a mix of influences, including Iyengar alignment, vinyasa flow, and comfortably held postures. Tara took her first yoga class for college PE credit in 1999 and it was (cliche but true!) love at first down dog. She went on to complete teacher training at Willow Street Yoga Center in 2005 and has taught over 5,000 hours of yoga since then. Tara has also completed trainings in restorative yoga with Judith Hanson Lasater, Jillian Pransky, and Cyndi Lee and continues to be inspired by the power of a quiet mind and a down-regulated nervous system. She is also inspired by the intersections of physical therapy and yoga postures and consider's Judith Hanson Lasater's Experiential Anatomy training to have had the biggest impact on the way she teaches asana. In her classes you can expect encouraging and lighthearted instructions that will help you explore familiar poses in new and interesting ways. When she isn't teaching yoga, you can find Tara playing outside with her three kids or at the small live music venues in the DC area. Tricia is a graduate of Willow Street and Body Balance Yoga teacher training programs (E-RYT 200, RYT 500) and is a certified Yoga Therapist (C-IAYT). Tricia's classes focus on dissolving tension in the body, creating optimal alignment, and connecting with the breath. She clearly articulates alignment instructions based on her knowledge of anatomy and exploration in her own practice. Tricia is so grateful to be able to share the healing power of yoga with her students.